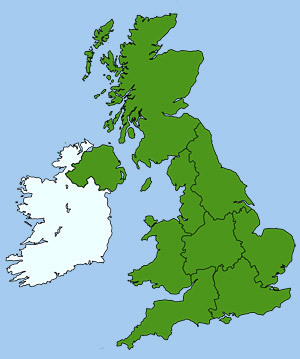 If you are a first time visitor to Britain then please see our pages on Getting to the UK and Travelling Around the UK for international and local travel advice. Britain provides a wide range of places to stay from youth hostels, camp-sites, self catering, bed & breakfast and guest houses to 5 star hotels. For more information see our UK Accommodation Page. British high street banks include: Barclays, Royal Bank of Scotland, HSBC, Lloyds and Santander. Cash machines (or ATMs) are widely available in the high street, outside banks, post offices shops, supermarkets, pubs and motorway service stations. Credit and debit cards are accepted by most major retailers and restaurants. The local currency is the Great British Pound (GBP) also known as pound sterling £. There are 100 pence in the £1. Coins come in 1p,	2p, 5p, 10p, 20p, 50p units, plus a £1 and £2 coin. Bank notes come in £5, £10, £20 and £50. Travellers cheques can be exchanged at most banks and post offices. However, while they are secure and provide peace of mind, they are not the cheapest way of exchanging currency because of the commission and handling charges involved. How Much do Things Cost in Britain? Mobile phones can be used in most areas of Britain, however, expect the signal to be difficult to find in more remote areas such as the Scottish Highlands and parts of Cornwall. Check with your mobile phone provider to see if you can use your phone from abroad and how much it will cost. Most suppliers will have to enable your phone first or you can use a dedicated or roaming SIM. Public phone boxes can be found in most towns, some take coins, others accept credit cards or you can buy a phone card from newsagents and convenience stores. You can access the web at most large libraries, Internet cafes and some types of accommodation such as YHA, motels and hotels (where provided). Remember to bring your phone charger, adaptor and record important numbers such as your country's embassy and insurance company. Emergency services such as Police, Fire or Medical can be contacted by calling 999 but this number must only be used in a true emergency, such as danger to life or if a crime is in progress. For all other non-emergency queries and less serious incidents, such as community safety and anti-social behaviour call 101. We drive on the left in Britain. If you plan on driving a car, motorbike or other road vehicle in the UK you will need an approved driving licence to do so. You may also need to obtain an international driving licence before arrival, depending on your country of origin, for details visit the DirectGov site: Driving in GB on a foreign licence. There are many good places to eat in Britain, ranging from Michelin star restaurants, cafes, pubs and fast food outlets to traditional English tea shops. If you want to experience some traditional British food then we would recommend eating at a pub or restaurant that serves local cuisine. See our section on Traditional British Recipes for information on some of the local foods available. BBC1 Countryfile: stories of people, places and news in the British countryside. BBC1 Antiques Roadshow: local people bring their antique possessions to be discussed and valued. BBC1 Eastenders: soap opera detailing the way of life and culture of London's east end. BBC2 Escape to the Country: British house buyers looking for a dream home in the country. ITV Coronation Street: soap opera about the residence of a typical terraced street in Manchester. ITV Emmerdale: soap opera about a local farming community set in the beautiful Yorkshire Dales. C4 Time Team: team of archaeologists who dig up the British countryside looking for historic finds. Many hotels and guest houses have satellite or cable TV, which providing a wider choice of programmes, including foreign news channels that will allow overseas visitors to stay in touch with things at home. Is London an Expensive City to Visit? For more information on Britain and the UK visit our Frequently Asked Questions page.